There are few fantastic tools available to keep your files in sync. Examples of these include FolderShare, ChronoSync, Unison, iDisk, SugarSync, and our favorite, Dropbox. Until now these tools could not be used to sync your 1Password data. With the new Agile Keychain format added in version 2.9 it is possible to sync information almost instantaneously and without conflicts. All changes are detected and reloaded by 1Password automatically. It is also possible to share the Agile Keychain between multiple computers on your local home network using a regular shared folder. What is the Agile Keychain? The Agile Keychain is a new keychain format developed to build on the success of the OS X Keychain and expand its functionality. The OS X Keychain has served 1Password incredibly well over the years and we are proud to support it. Over time, however, our users have required us to create something more flexible and portable that meets all of their diverse needs. 1 File level syncing is not practical with the OS X Keychain because everything is stored in a single file. Each modification causes the entire file to be recreated and then synced. This hurts performance and increases the chance of conflicts. 2The OS X Keychain slows significantly as its size increases because it creates an entire copy of the file and then replaces the original. 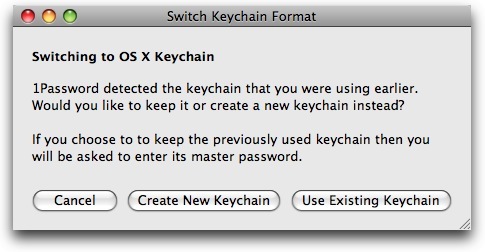 3 The OS X Keychain's AutoLock is based on keychain usage. The amount of time between using the keychain is calculated to determine if the keychain is locked. User activity such as typing or mouse movement is irrelevant. This forces users to specify a much longer Automatic Lock time than they might otherwise prefer. 4 The OS X Keychain uses Triple DES as its encryption algorithm which is quite secure, but it is growing older and has been superseded by newer encryption algorithms with longer key lengths. AES is the new standard used by the US Government. 5 The OS X Keychain has direct support for syncing with MobileMe. 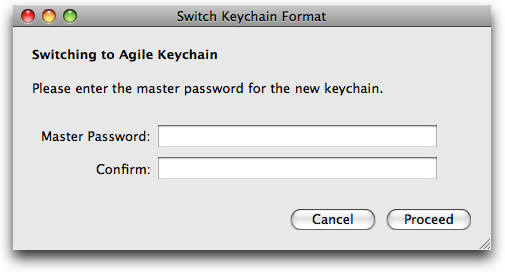 The Agile Keychain does not have this level of integration with MobileMe, but it can be kept on iDisk. For a full analysis of our need to design the Agile Keychain, please refer to the History of 1Password's OS X Keychain Integration. For details on how the Agile Keychain was designed and made secure, please see the Agile Keychain Design document. As mentioned, the OS X Keychain has served 1Password incredibly well. In fact, the majority of users are completely satisfied with its current functionality and will not be motivated to immediately transition to the Agile Keychain. Therefore, the OS X Keychain will continue to be a part of 1Password for the foreseeable future, and we will not be forcing people to move to the Agile Keychain. Over time, however, features will be added to 1Password that are only possible using the new Agile Keychain format and will require switching in order to access the new feature. Once provided, all your OS X Keychain items will be recreated and stored into the new Agile Keychain using the provided password. You can sync your files using any of the great tools available, but our favorite is Dropbox. You can download it from their site, watch their video to see how things work, and be up and running in a few minutes. 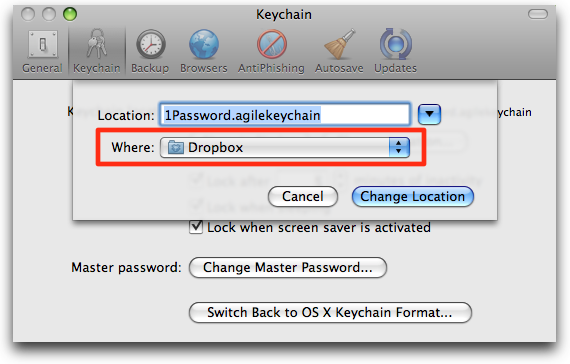 Clicking Change Location will cause 1Password to move your Agile Keychain to the Dropbox folder. That's all there is to it! Your keychain is now being monitored by Dropbox and automatically copied to all your other machines. After clicking Yes 1Password will configure itself to use this new keychain. Since the keychain is monitored by Dropbox, any change you make to your keychain will be automatically synchronized to all your other Macs. 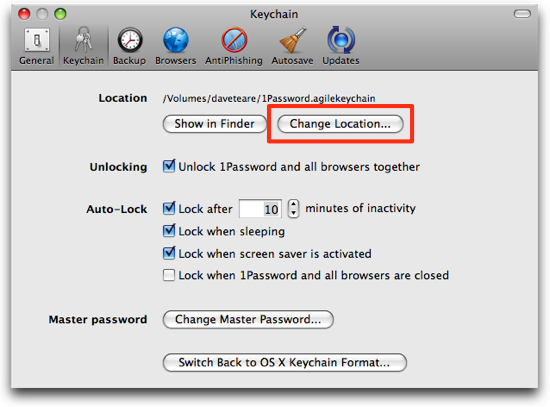 1Password and its browser extensions will detect these changes and automatically reload the keychain, allowing for completely automatic and seamless syncing without MobileMe. By popular demand I decided to add this section to detail how to use MobileMe's iDisk to sync your data. The steps are nearly identical to the previous section but instead of using DropBox you use iDisk instead. As mentioned in a previous blog post, after releasing the iPhone version of 1Password many people experienced permission issues every time 1Password was updated. It is very important to follow the recommend upgrade steps carefully to ensure upgrading does not result in the same permissions problem reoccurring. Basically what is required is to export all your data, upgrade 1Password, and then recreate your keychain. 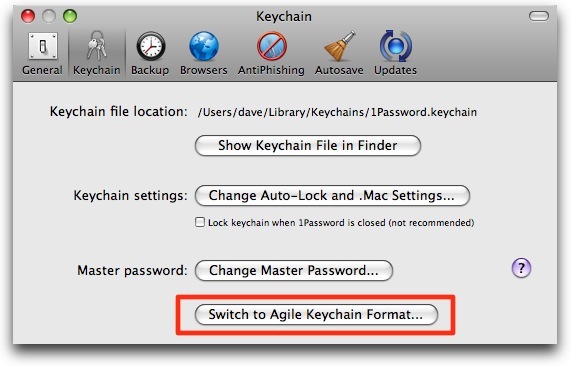 Detailed upgrade instructions can be found in the Recreating Keychains to Resolve Leopard Firewall Permission Issues section in the Using the 1Password Interchange Format document. Once upgraded and your keychain recreated, you can change to the Agile Keychain. The new Agile Keychain will avoid this permissions issue and switching to it will solve this problem once and for all.